Dynamic line constructions float through a neutral space. The intensity of the lines varies. While the dark lines push themselves into the foreground, the lighter ones disappear into the background. The open forms seem to fade into the indefinable depth of the image. At first this play of lines can simply fascinate us: the rhythm of the convex and concave lines, which at the bottom of the drawing form an indistinct tangle out of which three distinct forms arise. As you look longer, the ethereal lines change into the shapes of bones. Whose bones? Judging by their form they seem to be the bones of the arms, fingers and legs of human beings. Once belonging to a human like you and me, covered with flesh and muscle, they formed the skeletal frame of a body that moved erect through life. Now it is just a pile of bones, not much more than a memory of what once was. The artist connects this state of disintegration and absence of life with Jesus dying on the cross. During the creation of the series of charcoal drawings to which the one above belongs, she was especially moved by his last words: ‘I am thirsty.’ By this she does not refer to his ‘thirst for life, but for comfort, hope and the love from one human being to another.’ In this way she makes Jesus’ cry at the cross to continue. The dry and bare bones express not only his but also our longing for connectedness and fulfilment. But to these lines Lilian Moreno Sánchez has also imparted a movement that indicates the victory over desolation, as a gust of wind seems to blow the bones together into one pile and make some swirl upward. In this way the intervention of an outside force is made visible, resulting in a resurrection into a new form of life as God turns himself lovingly towards us. This reminds us of the prophet Ezechiel, who had to announce the descent of God’s Spirit on a large field of bones, so that they would assemble themselves into skeletons to be covered once again with muscle and flesh and filled with new life (Ezechiel 37:1-14). A miraculous tale, through which God assured the desperate Israelites in exile of his help and gave them the courage to rise from their lack of hope. Today Lilian Moreno Sánchez summons us to turn towards people who feel as hopeless as the Israelites in exile or thirsty as Jesus on the cross. 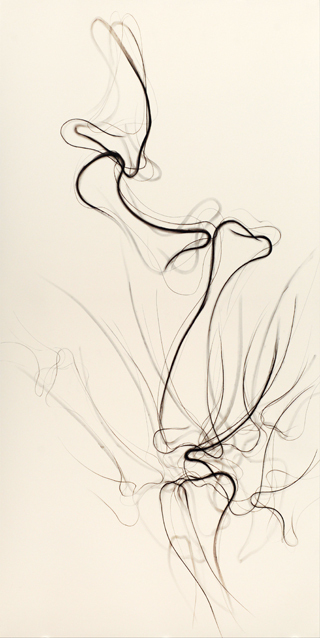 Lilian Moreno Sánchez: Tengo sed – Mich dürstet, Dibujo 2, 2012, 195 x 98 cm, charcoal and pastel on paper, © Lilian Moreno Sánchez. Lilian Moreno Sánchez (b. 1968) is an artist from Chile who lives and works in Augsburg, Germany. She has studied in Chile and Munich, Germany. She has won several prizes and has exhibited in South-America and Europe. For more information and to see more of her work, go to http://morenosanchez.com. Patrik Scherrer is the driving force behind the German website Bildimpuls. Every fortnight he sends around a ‘Bildimpuls’or visual meditation, in which he focuses on contemporary Christian and religious art from Germany, Switzerland and Austria. He studied theology and works with the mentally handicapped. He is the author of Gott in Sicht? 33 Impulse zum christlichen Glauben aus der Pinakothek der Moderne, Schnell & Steiner, 2005. On the Bildimpuls website there is also a lot of information to be found about artists, books, museums, exhibitions and organizations, see www.bildimpuls.de.